A dramatic increase in hotel space has created demand for a center that could handle as many as 3,000 people, City Manager Jon Jennings says. Portland is once again looking into whether it should build a convention center. The idea has come and gone like the tide over the last two decades, but has never overcome financing and siting hurdles. On Tuesday, the city staff asked the City Council’s Economic Development Committee to seek a request for proposals to study whether building a convention center is feasible in Maine’s largest city. The three-member panel told the staff to come back early next year with an estimated cost for a study and a commitment from the private sector to help pay for it. Councilor Justin Costa, who leads the committee, said it would be a while before the city hears details about the costs of building and operating a convention center and where it might be located, although tourism officials have expressed interest in having it downtown. “We’re pretty far removed from having a concrete proposal,” Costa said. Economic Development Director Greg Mitchell said that given ongoing development in the city, options for siting a facility on the peninsula are dwindling. He said that the Portland Co. site at 58 Fore St. on the eastern waterfront is one of the few remaining parcels that could accommodate a large building with access to public transit and parking. City Councilor Nicholas Mavodones, who serves on the committee and was on the council when previous proposals were considered, urged councilors to ensure that the cost of the study and the facility itself doesn’t affect taxpayers. “My recollection is that whatever entity runs the convention center may not operate in the black and I think we need to be mindful of that impact on our taxpayers,” Mavodones said. Mavodones is seeking his eighth term on the council. 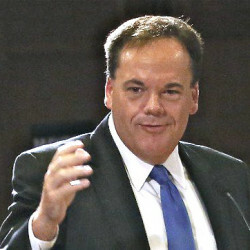 His opponent, Joey Brunelle, blasted the proposal on social media. The last study of the idea was by the Boulos Co. in 2002, according to Lynn Tillotson, president and CEO of Visit Portland. At the time, the company was looking at building a facility at the Top of the Old Port parking lots near City Hall on Congress Street. City Manager Jon Jennings also said the increase in hotel rooms – as well as the city’s growing reputation as an arts, culture and food destination – have created a need for a convention center that could accommodate 2,000 to 3,000 people. During an interview with WGAN Newsradio Friday morning, Jennings lamented that the city hadn’t pursued a proposal by the Libra Foundation in 2000 to build a center in Bayside. “We know we’re turning away an incredible amount of business that could come to our city, not just in the summer months but throughout the year,” Jennings said. Tillotson said local companies, such as Wex, Idexx and Unum, have to travel out-of-state to hold a convention because there are few options in Maine. She said attendance at the Governor’s Conference on Tourism has been limited to 450 people because of limited capacity at venues like the Holiday Inn by the Bay, Augusta Civic Center and Bangor Convention Center. She said the event could easily draw 1,000 people. Having a convention center downtown, where people could walk to restaurants, shops and hotels, would be a huge draw, Tillotson said. Such a facility would encourage convention-goers to return for a visit or stay for an extended vacation, with positive economic ripple effects for areas businesses.